The Wave Recording ...a Timeless Classic!! 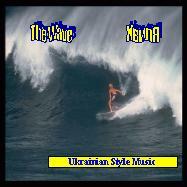 The Wave release of Ukrainian Style Music offers nearly 55 minutes of a musical journey. The release includes 8 energetic polka type songs, several medleys as well as three wonderfully romantic ballads. Something for everyone. Best of all, even though most of the songs are in Ukrainian, their interpretation could not be clearer to the individual listener and new fan of The Wave. You may have heard it before....hear it all again like it was the first time. A complete discography is available in the multi-page booklet that comes with the recording.